How can we prepare the cohabitation of robots and humans on the Moon? Artists and space experts discussed the issues on November at the first workshop of the Moon Village Association in Strasbourg, France. “Sooner or later, we are going back to the Moon, whether to mine it, to rehearse for a Mars mission or to just live there. But how will human activity there reflect what has happened on Earth since the last Moon mission, to reflect the diversity and political and social changes that have happened since? Can artists imagine what it would be like to live on the Moon?… There are already artists in Antarctica. 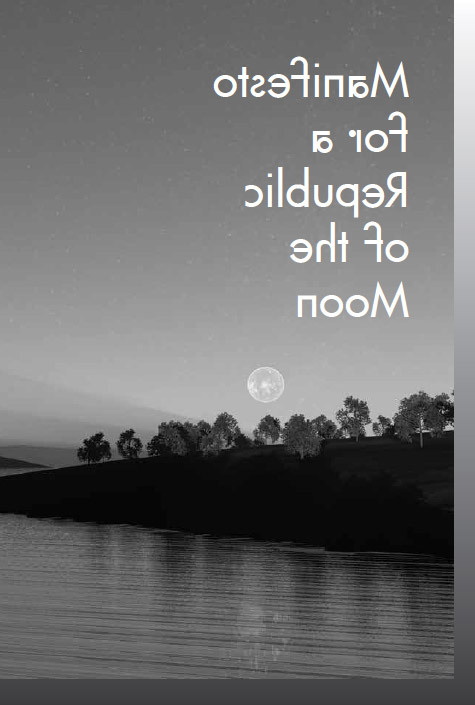 It should be inevitable that artists will sooner or later accompany the next visit by humans to the Moon.” I wrote this Manifesto for a Republic of the Moon in 2014 for the eponymous Arts Catalyst exhibition I curated. Three years later, an unusual group of scientists, engineers, mission specialists, spacecraft designers, roboticists, sociologists, psychologists, architects and yes, artists, gathered at the International Space University (ISU) in Strasbourg in November 2017 for the first formal meeting of the Moon Village Association, with the blessing of the European Space Agency (ESA) and inspired by Bernard Foing, the father of SMART-1, the first European mission to the Moon, to discuss the future of a human-robotic village on the Moon, how it might be built and how it might function. A village is different to a space mission. It requires a whole new mindset of thinking to reflect the whole of human culture, very different to the militarized vision of the Apollo missions (one thinks of the lyrics to Gil Scott-Heron’s 1970 “Whitey On The Moon” and the old apocryphal feminist bathroom graffiti joke: “If they can put a man on the Moon, why can’t they send them all there”). As a preamble, German artist Hagen Betzwieser, of the duo We Colonised the Moon with UK artist Sue Corke, cited at the workshop the famous punk provocation/performance First Woman On the Moon by Aleksander Mir, performed as a mock Moon landing on a beach not so far from ESA’s facility at Noordwijk, exactly 30 years after the actual Moon landing in 1969 by Neil Armstrong. The performance apparently prompted a correspondence between her and the famously reclusive astronaut. Betzwieser also reminded us of the reputed quote by veteran cosmonaut Sergei Leonov: “Astronauts can be hobby artists, but artists cannot be hobby astronauts,” (presumably referring to painter and former lunar astronaut Alan Bean, who continues his practice of mixing his paint with fragments of moondust from the spacesuits that NASA allowed him to keep). 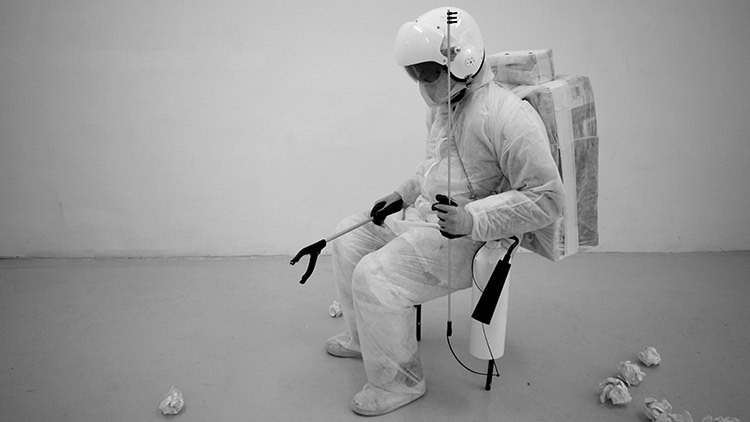 Could cohabitation on the Moon begin with the cohabitation of artists and space experts? We Colonised the Moon recruited the famously grouchy second man on the Moon, Buzz Aldrin (he once publicly punched a lunar conspiracy theorist on the nose when he tried to get him to swear on the Bible that he had really been to the Moon) to endorse their scratchcard project The Smell of the Moon. The lunar dust, on entering the atmosphere, apparently smelled like gunpowder; Aldrin verified the smell. When it comes to cohabiting on the Moon, fundamental issues are seriously being considered. At the Moon Village workshop, the theologian and founder of the Lifeboat Foundation Michael Waltemathe raised the question of which way Muslims should pray to face the Mecca while in lunar Earth orbit? He joked: “God wants adoration not acrobatics.” Interestingly, this problem is solved in Artemis, the new novel set on the Moon by The Martian author Andy Weir, in which the father of the heroine invents a revolving prayer wall. Waltemathe also cited the work of Jorge Mañes Rubio, artist in residence at ESA, who has devised a temple for the Moon, Peak of Eternal Light, an all-purpose ritual space 3-D printed with lunar regolith. Considering the issue of “reification” in a future Moon Village, Waltemathe likened a potential lunar settlement to a Carthusian Monastery, with monks living in total isolation, but where lay monks can interact with the outside world in an “airlock” where turnips are traded for letter-writing skills. Speaking of belief, our faith is being seriously tested by the current situation of the Google Lunar Xprize, which has shifted its deadline numerous times since 2007 for a privately-funded mission to land on the Moon, send a rover 500 meters and transmit HD video images back. The deadline for the five finalist teams to launch their missions was until recently December 31, 2017, but this has been moved again to March 31, 2018, without specifying a launch date. 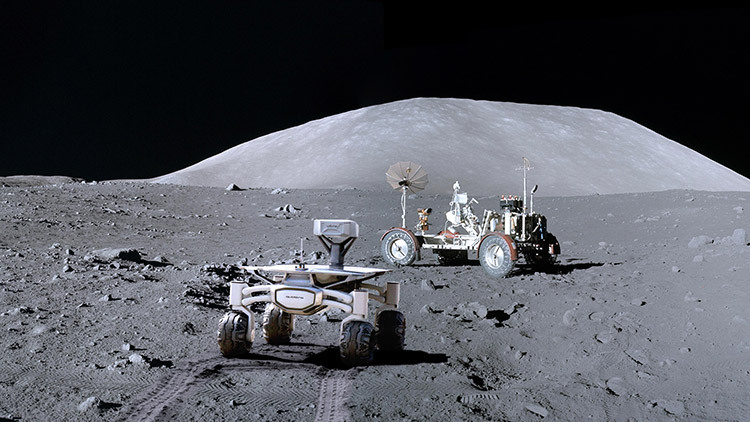 Still, the prize seems to make it likely that the Moon will be populated more and more with robotic rovers, waiting for humans to join them soon. One of the strongest contenders is TeamIndus from Bangalore, India, who have built an almost DIY lunar spacecraft-lander with the help of volunteers and students, which will be carried into orbit by the Indian Space Research Organisation’s PSLV launcher. ISRO made history by launching India’s first Chandraayan mission to the Moon in 2008. According to team leader Rahul Naryanan, “A small group of friends registered as the only Indian team competing for the Google Lunar Xprize on finding that India had no other representative. None of them had the first clue about a space mission. They saw a problem and they wanted to solve it.” Their enthusiasm for the common dream of TeamIndus is further consolidated in this music video of an “anthem” performed by the popular Indian band Sanam. In the spirit of international collaboration, the TeamIndus spacecraft will carry the rover of the Japanese team Hakuto, which Makery also wrote about. The journey of the rover Ek Choti si Asha (A Small Dream), or ECA for short, has already been the subject of a dance performance by the Bangalore-based dance group Attakkalari Centre for Movement Arts, filmed by UK artists Daniel Saul and Rachel Davies (and recently aired on Channel 4). Saul and Davis are planning some site-specific events in India during the launch and rover landing in 2018, and intend to work with stereoscopic imagery from ECA herself—yes, she is the first female rover. Finally, the interestingly named Part-Time Scientists of Germany (since renamed PTScientists), while no longer competing for the Google Lunar Xprize, seem to have a very credible lunar strategy, heavily sponsored and branded by Audi and Vodafone. They are potentially controversially aiming to land near the so-called “heritage site” of Apollo 17 in 2019, with the support of a new organization for preserving Moon landing sites. Forallmoonkind, fronted by Kate Arkless Gray (SpaceKate) aims to “Ensure the six Apollo Lunar Landing and similar sites in outer space are recognized for their outstanding value to humanity and consequently preserved and protected for posterity by the United Nations and the international community as part of our common human heritage”. At Moon Village, she also mentioned the artistic aspect of the PTscientists rover—in addition to visiting the iconic LRV or Moon Buggy, it will carry a time capsule for the Sanctuary Project, a specially created art archive (illustrations, literature, art). After pointing out the lack of female participants at the Moon Village workshop, Gray mentioned the recent sale of a Leonardo Da Vinci for 450 million dollars and asked if this was so, how much more would the Apollo 11 lunar landing plaque and similar artifacts currently residing on the lunar surface fetch? It all comes down to money, in the end. As they like to say in the space industry: No bucks, no Buck Rogers.